Imagine walking up to a trading screen (any broker or vendor’s trading screen), entering a trade and when the trade is filled, having the fills automatically show up in TheBooks. That is what FIX Drop copy in TheBooks provides. FIX stands for Financial Information eXchange (FIX) Protocol and is a messaging standard developed specifically for the real-time electronic exchange of securities transactions and is supported by most trading partners. TheBooks supports both versions 4.2 or 4.4 of the protocol and several vendor-specific variations of these versions. Our hypothetical advisor has both discretionary and systematic trading components in their programs and have a fund as well as several managed accounts. They execute trades through multiple platforms through multiple brokers and have clearing relationships with three separate firms. They trade most or the major liquid global futures markets as well as some options and equities. Each trading partner requires trade allocation information to be transmitted to them via an sFTP file transfer in their own specific format as soon as the trade has been filed. Each of the claring firms require an end of day file with trades they should expect from the various executing parties, and several 3rd party administrators as well as investors also require a daily recap of trades done in their accounts either sent via email or sFTP. The FIX interfaces are implemented as point-to-point, always up connections over VPNs. The sFTP and email connections use the internet and are used as needed. Discretionary traders trade through multiple platforms such as TT’s X_TRADER and Goldman Sac’s Redi+. System-generated trades are placed into the market through the programming interface of a popular trading platform. As trading occurs, fills, regardless of source, are automatically routed to TheBooks via the FIX connections. 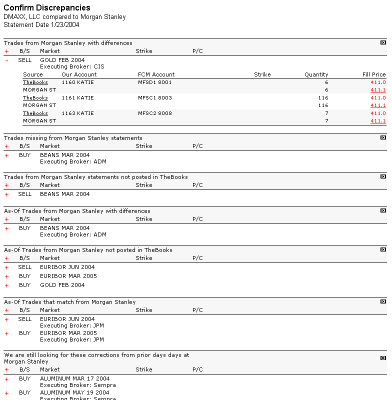 Fills for each ticket are consolidated into trades within TheBooks and are booked to what is known as a holding account. This is done because as orders are worked, the ticket number for a trade typically changes as the limit is moved. This is a function of the execution platform, but the behavior is pretty standard across platforms. The result is that multiple tickets could really be part of a single trade. By having the trades booked to a holding account, the advisor can select multiple tickets that are to allocated to a block of accounts as a single trade. For platforms that do not generate new ticket numbers as the trade is worked, TheBooks could be configured to automatically assign the trades to a pre-selected block of accounts. After a logical trade has been completed, the trader or back office personnel select the ticket(s) which make up the logical trade and associate them with the group of accounts which are to be allocated to the trade. As an option, the trade can be associated with one or more strategy (or system) to allow tracking of virtual positions and performance by strategy. Contract quantities are automatically assigned based on the each account’s relative trading size and once saved, quantities and fill prices are allocated to the accounts. 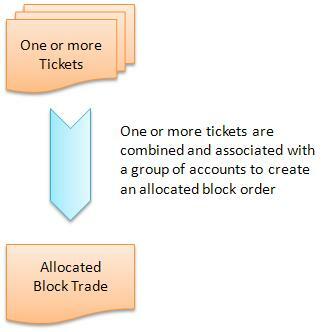 If the advisor wanted to work up trades in advance of execution (using TheBooks ability to combine trades from multiple systems/strategies, for example), the assignment of the ticket to the block of accounts can also be done by simply selecting an existing trade rather than specifying a group of accounts. In that case, the fills from the tickets are “pushed” into the existing trade. Once the block order has been allocated, TheBooks automatically sends allocation information to those 3rd parties configured to receive it. In the case of the executing broker, this is typically done immediately. In the case of clearing brokers, administrators, and investors, this data is typically sent at the end of the day. In all cases, the advisor is able to configure the format of the file, including symbology to be used and the transmission method (email, FTP, sFTP, etc) and whether the information is to be sent at trade completion, at end of day, or both. By using TheBooks FIX drop copy interfaces in conjunction with its order management capabilities, this advisor easily implemented a diverse portfolio of trading strategies and execution platforms across multiple managed accounts with a minimum of manual effort. Any CTA with managed accounts knows that one of the most time-consuming aspects of the job is reconciling your books and records with those of your clearing brokers. This becomes an especially arduous task when you have clearing relationships with multiple brokers. It seems that no two brokers have the same statement format, use the same symbology, or adhere to a consistent price convention. What makes things even more frustrating is that most of the effort is spent reviewing trades that are correct in order to locate the ones that are wrong. 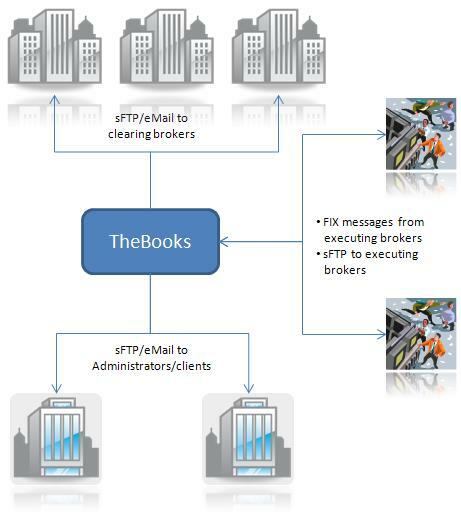 TheBooks reconciler automates this process and presents you with the trades, positions, and balances that do not agree, eliminating the tedious process of manually locating discrepancies. TheBooks reconciler reads human-readable statements, not data files. This allows you and the software to use the same source when reviewing the information provided by your brokers. In addition, TheBooks automatically organizes, encrypts, and compresses your statements and saves them within its database providing a single point for backup. It also includes facilities for exporting your statements onto disk in an organized fashion allowing you easily prepare for audits. 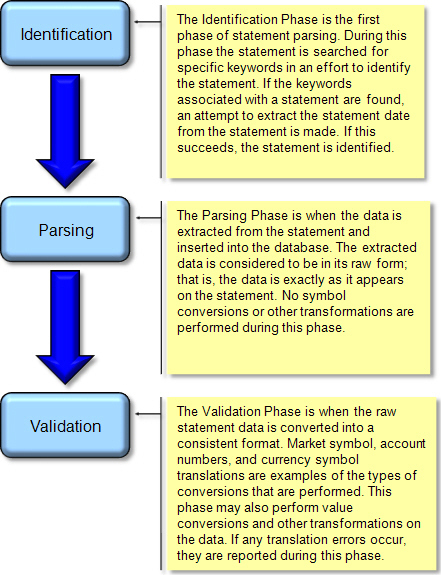 The third step, validation, is what converts the data from the various standards that exist on broker statements into the standard you have defined in TheBooks. This step uses what are known as statement symbols to translate and, if required, re-value symbols and prices and is based on the settings you configure. In this way, TheBooks performs standards-independent data transactions from the broker statements into the format you desire. When you ask the reconciler to look for differences, it only shows you the trades (or positions, or balances) that are different. You then spend your time resolving the issues; rather than looking for the issues. In addition, TheBooks reconciler maintains a list of open trade breaks and includes them on any break sheet you send to your broker. As missed or extra trades are corrected on your statements, they are automatically removed from the list of open breaks. Price corrections are also detected and reported. TheBooks reconciler’s ability to read the same statements you read, convert the symbology and price conventions to your standard, and to present you with only the issues, makes it an invaluable tool for the CTA with managed accounts.